The huge Mercedes-Benz showcase at the 2017 Frankfurt Motor Show last week included displays of the X-Class, which had its own little area outside Hall 2 in addition to the usual fare inside the pavilion. The automaker had both launch variants of the pick-up – the X 220 d and X 250 d – on call in manual and automatic forms respectively. The visual similarities to the Nissan NP300 Navara, especially around the centre cab section, is inescapably evident, but the X-Class – which measures in at 5,340 mm long, 2,113 mm wide and 1,819 mm tall – is Mercedes through and through from the front. Distinct styling elements include C-shaped headlights and an unmistakable twin slat grille, complete with a huge tristar. The rear end has been kept simple, with flat C-shaped tail lamps (and a Mercedes logo) the pointers to its identity. The interior is also very much Mercedes, though there are giveaways to its shared underpinnings – the Navara’s console-mounted gearshift lever is one, as are switchgear controls. 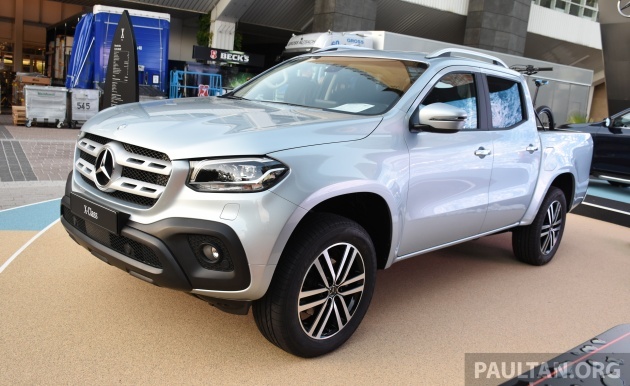 Nonetheless, elements such as round air-conditioning vents, three-spoke steering wheel, instrument cluster, the COMAND infotainment screen and controller on the centre console give the X-Class enough brand-related character. Standard equipment for the pick-up – in its domestic market – includes a comfort suspension, seven airbags as well as Active Brake Assist, Lane Keeping Assist and Traffic Sign Assist, with cruise control and Mercedes me connect services also to be found. Power comes from a Renault-sourced 2.3 litre four-cylinder engine that equips the Navara in certain markets, the X 220 d featuring a single turbo while the X 250 d’s mill comes equipped with sequential twin turbos. Output numbers for the X 220 d are 160 hp (or 163 PS) and 400 Nm, and paired with a six-speed manual transmission (the standard gearbox for the pick-up), performance figures for the variant include a 0-100 km/h time of 12.9 seconds and a 170 km/h top speed. The motor on the X 250 d, meanwhile, offers 188 hp (or 190 PS) and 450 Nm, and even with the optional seven-speed automatic transmission, the variant is expectedly quicker off the mark, doing the century sprint in 11.8 seconds. With a 176 km/h top speed, it’s also marginally faster. The show cars were 4Matic examples, equipped with switchable four-wheel drive. The diamond silver metallic X 220 d display unit in Frankfurt featured two-tone black Posadas fabric seats, a standard 5.4-inch COMAND screen and an Audio 20 infotaiment system along with manual air-conditioning. The show car came kitted out with a Progressive equipment line, which adds on an eight-speaker system and a load securing rail system. It was also fitted with an optional Style package, and as shown was priced at 51,230 euros (RM256,200). As for the X 250 d, the cavansite blue metallic example came dressed with black leather seats and a COMAND Online navigation system with a larger 8.4-inch centre display. A Power equipment line package adds on LED high performance headlamps, Keyless Go, Thermotronic auto climate control and an Artico faux leather dashboard. The show car also came equipped with a parking package, complete with a 360-degree camera, a roll cover and a winter package. Specified as such, the variant had a 63,900 euros (RM319,570) price tag. The X-Class will begin going on sale in Europe this November, followed by South Africa, Australia and New Zealand in 2018 and in Argentina and Brazil in 2019. What do you think of Mercedes’ first pick-up? Would it be a commercially viable proposition here? Share your thoughts with us in the comments section. Our Boyue is better than this Mercedes fake navara car. I believe Proton has come out with a big successful product…the Boyue! Let us support it! When people here find out that it shares many components with the Nissan it is based on, this is either going to 1) raise the status of the Nissan or 2) lower the perceived status of Mercedes. Probably the latter. since its a pickup, technically it should be classified as ‘kenderaan komersial’ right? wont be too expensive. no? Ini…baru lah. Good job TanChong! Cloned iPhone. The inside is Navara. Even the chassis and engine is same as Navara. Is the rear suspension as saggy as the Navara’s? It doesn’t sag, boy. It has multilink suspension and not leaf and coil springs like the T and the F, M and I included. Unless you own one or drive it regularly, will know. I own the VL or the towkay model not the worker’s ride. RM320k for a pick-up? Anyone? Anyone? Cars, vans, suv, bus, trucks, and now pickup trucks.. one more left, motorcycle..
Maybe go all the way, do bicycle at one end and private jet on the other end. Can’t c the logic in MB doing this! Outside still looks a lot like its donor truck. But inside is all Mercedes, in looks anyway. Not sure about material quality. Any chance of Affalterbach getting their hands on this. Just get a Navara and spend the leftover on something else, not sure who will buy this in Malaysia. Somehow this merc looks liw class.. i dont know why..
my 10 years old triton 12 second hit 100km/h, top speed 190km/h, why Mercedes top speed below 220km/h? Why? Reminds me of lyrics by Dire Straits “Money for nothing”. any Japanese milo tin feel? when u wanna pickup ikan at 9.50 and date at 9.55……..
those rich tuan tanah bukit durian can drive this to ronda their pokok-pokok durian and fetch some durians out to give away. IMHO i think it would only be a commercial disaster. If my plumber drops by with THIS pickup, I’m definitely in the wrong line of business. How come vw never promote their pick up here? Amarok. wow Navara with German Engineering.. kek! This pickup is for stylo milo contractors…..and to visit construction site with style…..